Local Historians Phil Holmes and Jill Singleton teamed up to create a pictorial history of Niles. Niles started as a Spanish era settlement where the waters of Alameda Creek were harnessed to power a grain mill. 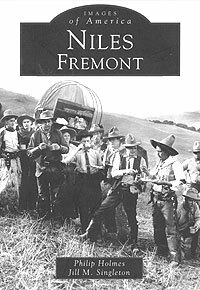 In turn Niles became: a nexus of the transcontinental railroad, an open air film studio where Broncho Billy, Charlie Chaplin and Ben Turpin created classics like “The Tramp”, a commercial nursery center where fruit trees and grape vines were grown for California’s farms and vineyards, and a classic California suburb with lush gardens and quaint homes. Richly illustrated with vintage photographs.